A Solo and Duet Recital by Robert and Heide von Bernwitz (viola). Pieces by Abel, Elena Kats Chernin, Peter Askim and Rufus Reid. A Discussion/ Lecture on Bass Teaching and Playing techniques. A Bass Ensemble Playing Session. Music by Teppo Hauto Aho, David Heyes and Simon Garcia. Music available before the workshop if requested. This workshop is suitable for Bass students, amateur Bass Player and Bass Teachers. AUSTA Members and their students $20. Non Members $40. Rob Nairn recently returned to Australia to teach at the University of Melbourne and the Elder Conser vatorium.He was previously a Distinguished Professor of Music at Penn State University and on the faculty of the Juilliard School. He is Principal Bass of the Australian Brandenburg Orchestra and the Handel and Haydn Society in Boston. He has performed with the Boston Early Music Festival, Juilliard Baroque, English Baroque Soloists, the Orchestra of the Age of Enlightenment, Ironwood, and Adelaide Baroque. 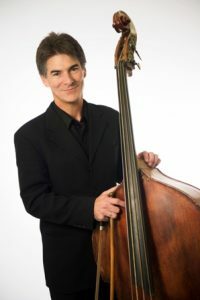 In addition, Rob is active in commissioning new works for double bass and has premiered more than forty compositions. He has recorded for Decca, Deutsche Grammophon, Sony, EMI, Virgin, ABC Classics, and Channel Classics. Teachers include Max McBride, Klaus Stoll and Tom Martin.